The specific objective is to enhance the collaboration, networking and learning of cluster organisations and their members towards the professionalization of specialised and customised business support services provided or channelled to SMEs. This shall further contribute to strengthen ties between European ecosystems across regional and sectoral silos with the view to support a sustainable inter-regional partnering process and joint actions for strategic collaboration in various industrial specialisation areas linked to industrial modernisation and improving their business environment. The aim is to foster cluster excellence capacity-building and to promote cross-cluster learning in order to help cluster organisations and their members to acquire the necessary skills and take actions to explore and take up new solutions. This shall address training and business needs along the value chain that require SMEs and cluster managers to adapt to trends, challenges and opportunities that come along with industrial change. This shall also include the development of strategic approaches and plans for a better cooperation at regional, national and EU level to address innovation, growth and globalisation challenges that SMEs face. This measure shall further enable groups of specialised enterprises, notably SMEs, together with other innovation actors in clusters, to find partners with complementary competences, to access value chains that cut across national, regional and sectoral boundaries as well as facilitate their access to technology centres and other scaling-up support organisations. This shall focus on engaging actors from regions with different levels of economic development – including from less developed and transition regions – and, likewise, cluster organisations with distinct stages of development and experience. 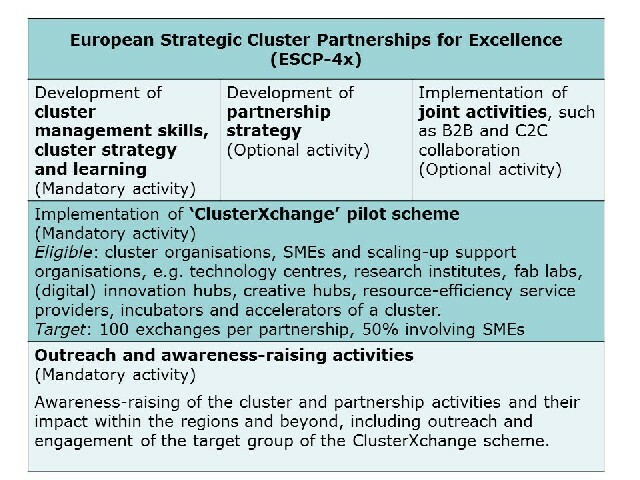 The types of expected activities can comprise of supporting the development of cluster management skills, cluster strategy both at individual and Partnership level and the organisation of twinning, collaboration, networking and learning activities as well as joint activities for implementing business-to-business (B2B) and cluster-to-cluster (C2C) collaboration projects. It must also include the implementation of the new “ClusterXchange” pilot scheme by facilitating the promotion, recruitment, matching and follow-up of short-term exchanges from cluster organisations, technology centres and other scaling-up support organisations and SMEs that members in a cluster from a COSME participating country. These are to be further supported by outreach and awareness-raising activities. Important notice for British applicants - Please be aware that eligibility criteria must be complied with for the entire duration of the grant. If the United Kingdom withdraws from the EU during the grant period without concluding an agreement with the EU ensuring in particular that British applicants continue to be eligible, you will cease to receive EU funding (while continuing, where possible, to participate) or be required to leave the project on the basis of Article 34.3.1(b) of the grant agreement. The applicant must be a legal entity with a legal personality. This may include both profit-making or non-for-profit legal entities as well as fully or partly public or private bodies. In the case of private bodies, they must be properly constituted and registered under national law. The link to the submission system is available on the Funding and Tenders Portal. In February 2019 EASME plans to organise an Information session for potential applicants. The exact date and agenda will be published on this page and European Cluster Collaboration Platform. If you have a consortium and you are looking for partners to apply to this call or you are looking for a consortium active in the same domain as you, you may use the European Cluster Collaboration Platform. Potential applicants should address questions related to the content of this call by e-mail to EASME-COSME-CLUSTER-EXCELLENCE@ec.europa.eu. Only questions sent to this functional mailbox will be answered. Answers will only be published periodically and within a reasonable period of time on this page. Last questions to be answered are those, which will be submitted at least 7 days prior to the closing date of this call. Please find here all the related documentation for the application.